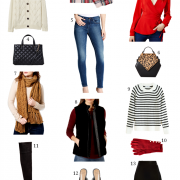 I’ve always believed that not every trend works for every person, which is why I usually pick a few to try out each season (like peplum & menswear) and let the others go (like wedge sneakers & overalls). The new wave of crop tops really had me intrigued, but I wanted to test the waters a bit before I actually purchased one. So, I temporarily altered a top I already owned by folding it under & securing with double-stick tape. Paired with a longer-length full skirt, it comes off as polished & sophisticated without showing too much skin. These pointed pumps finished off the ladylike look perfectly – I still can’t get over how comfortable they are! Because they have such a gorgeous rich suede finish, I took the time to treat them with this protector so they’ll hold up even better as I wear them through the fall. What a great idea! I love the crop top look and I still haven't found a crop top that I like that is plain and feminine! I should definitely look through my woredrobe and find a top that I can roll up and pin. This is a lovely outfit..
Great clutch and skirt! You look pretty! Omg you look so so so beautiful. A crop top is not a trend I will ever try (I don't have the body for it and also don't feel comfortable with it in general) but you pull it off amazingly well and I love that you show just a hint of skin with such a beautiful and classy skirt… so you still look so classy! I want to steal that skirt right off you! Gorgeous! and what a great idea to temporarily alter something to try out the crop top! why didn't I think of that? 🙂 also, I came home today to my copy of "Lucky" and it was very cool to see you in the Almay ad! this is just so beautiful on you – the shapes and crop are unexpected! Umm…genius! I love this outfit! The "crop" top is perfect and the skirt is so pretty! lovely outfit! the skirt is very pretty. This outfit looks so lovely! The skirt is simply amazing! Oooh la la love this! Very Mad Men in it's glam feel and ladylike essence. The colors work so beautifully together, just the right transition into autumn. Your hair looks fabulous with that slight bit of wave to it as well…thanks Kim! double stick tape to make a crop top is genius! definitely works well with a more structured top like yours. This is totally crop top done right! Love the polished yet fun vibe this look gives off! I absolutely LOVE this look on you! You can seriously pull off a crop top without a worry! Also madly crushing on this skirt-the print is stunning and the lightness and flow is heavenly. 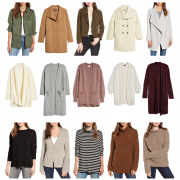 I seriously need to come live in your closet-so many stunning pieces! I love that you're just showing a hint of midriff. Your diy crop top is too cute! totally agree with you on crop tops – the less skin it shows, the prettier it is! You are so beautiful. This outfit from head to toe is just simply divine. So so chic! What a great idea! I've been really on the fence about crop tops as well, but now I can try it out before committing to a purchase! Great idea to try out the trend! I also love the crop top trend but am unsure if I feel comfortable pulling it off.BTW…I need that clutch! You look amazing! 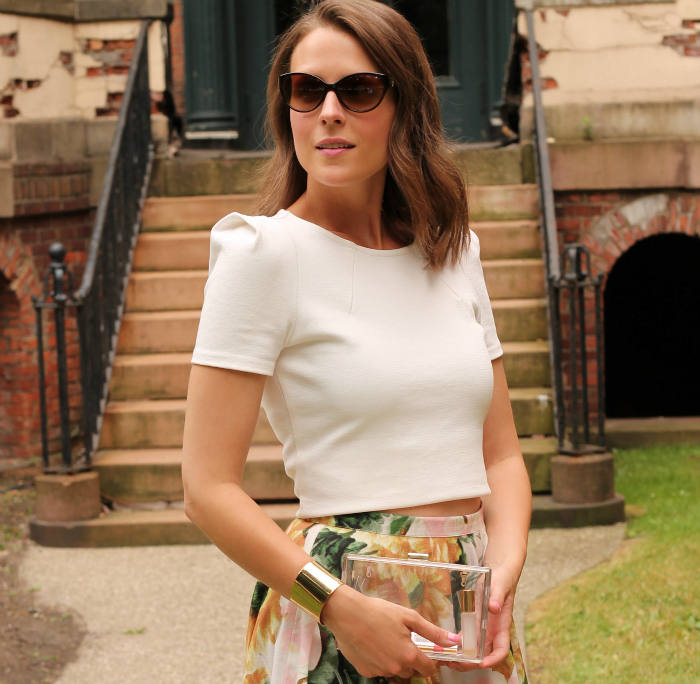 I LOVE this crop top and skirt pairing with the lucite clutch! So gorg! What you did with the top was a great idea…this looks awesome on you! Wow— I totally believed that was a true crop-top! Good job! Looks great on you. I like to pair crop-tops with high-waisted shorts and skirts. What a brilliant idea with the double sided tape! Looks great on you! Simply stunning! Love the skirt but also that cropped top is amazing. I love how you translated this trend and made it more sophisticated. I would have never thought to simply fold a shirt, it looks great with the skirt, I love it! You look like perfection in your crop top! Love how you DIYed that! You are just so flippin' amazing Kim! Hugs! NICE! Look at you go! I would have never thought to do that and it looks amazing! 🙂 Love it paired with this skirt… the right way to do crop tops in my opinion because this is so classy! I love that you made your own crop top! You look fantastic! I got those heels as well. Cannot wait to style them! SO classy! This look is very "50's" and I'm loving it. LOVE this. Creative idea on trying out a crop top without looking like a tween! This is my favorite way to wear a crop top 🙂 Plus, I'm loving the strong shoulders of the blouse!! 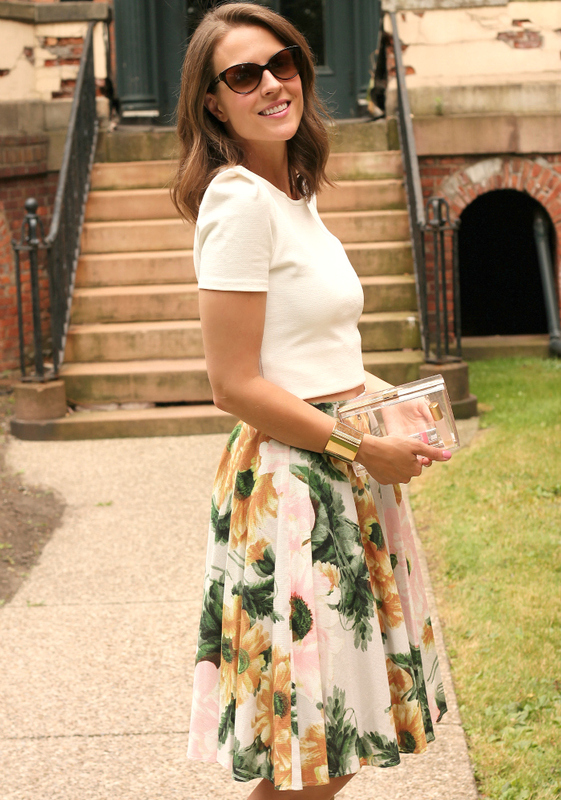 I love that you made your own crop top + this outfit is so fantastic on you! i have those pumps in navy from last year. i think i need this color this year. they are so comfortable and cute! What an amazing idea! This crop top looks so beautiful on you and it's perfect with this skirt. The shoes are gorgeous too. Lovely pictures and outfit! Two words….NAILED IT! This is definitely one of my faves from you…who would have thought that a crop top could look elegant??? You have changed my mind about them! GORG!! 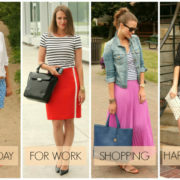 The crop top trend is not for me but I think by pairing it with a full skirt, it looks so pretty & feminine! I love this outfit! The clutch is fabulous! I LOVE your shoes! 🙂 Beautiful! What a great and simple idea! and, DUH hy didn't i think of that! I know that zara top. its the one that i always get makeup on taking it on and off! Love that skirt! I saw it on another blog not too long ago and almost purchased it. Really interesting choice of clutch too! I love that it’s see-through! Love that skirt! I saw it on another blog not too long ago and almost purchased it. Really interesting choice of clutch too! I love that it's see-through! Very ladylike and sweet. The tiny sliver of tummy is not offensive in the least. It’s the most tasteful crop-top I’ve seen. I like your lady-like version of the crop top! The volume and length of the skirt balance out the short top. I don’t think I could ever wear a crop top, but if I did, this would be a great starting point! Very ladylike and sweet. The tiny sliver of tummy is not offensive in the least. It's the most tasteful crop-top I've seen. I like your lady-like version of the crop top! The volume and length of the skirt balance out the short top. I don't think I could ever wear a crop top, but if I did, this would be a great starting point! That top is amazing! Love how you styled it!